Note: All physics majors are required to fulfill three sets of requirements: Department of Physics and Astronomy Requirements, College of Science Requirements, and the University Core Requirements. The majority of upper level (300 level and above) physics courses must be taken in residence at Purdue. Students can use transfer credits for no more than 50 percent of the upper level physics courses in order to receive a Physics and Astronomy B.S. Degree. Only free elective courses can be taken under the pass/non-pass grade option. When did you start in Physics? 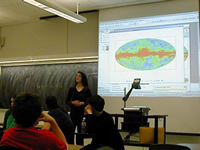 Students are required to use the College of Science requirements prior to Fall 2007 and to use the Department of Physics curriculum prior to Fall 2007. Students who began in Fall 2007 can choose this curriculum or the new curriculum that began in Fall 2008. However, they CANNOT choose one set of requirements from the Fall 2007 curriculum and another set of requirement from the Fall 2008 curriculum. 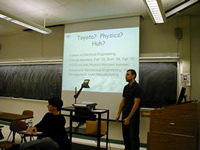 Students are to use College of Science Requirements effective from Fall 2007 or later AND Department of Physics Requirements effective from Fall 2008. Transitional changes in curriculum offering between Fall 2004 and 2006. All others: Please see the Physics Academic Counselor (Ms. Thomaz thomazj@purdue.edu) as requirements are slightly different. Presentations Given by Physics students in PHYS 235 "Careers in Physics"